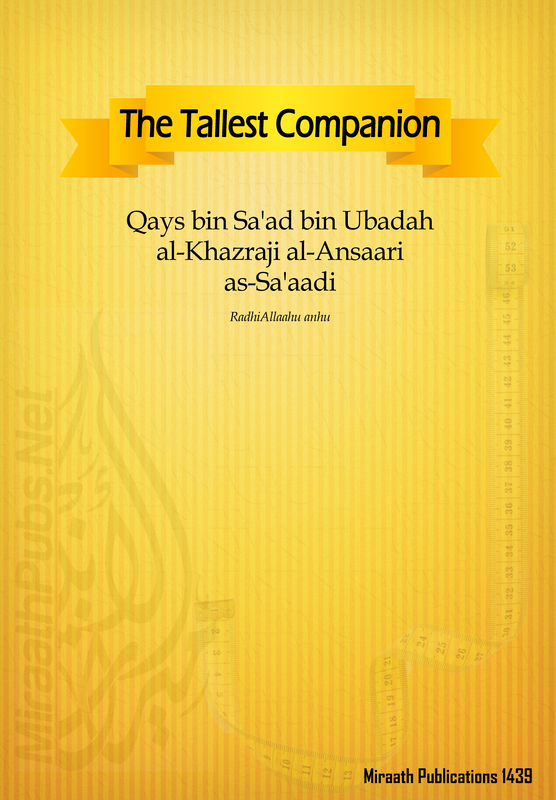 ‘A Companion of the Messenger of Allaah sallAllaahu alayhi wa sallam and the son of a Companion. Qays bin Sa’ad bin Ubadah al-Khazraji al-Ansaari as-Sa’aadi RadhiAllaahu anhu. He narrated a number of Hadeeth. Amr bin Dinaar said: ‘Qays bin Sa’ad was an extremely large man, bulky. He had a small head and his beard did not grow. When he would sit upon a donkey his feet would trail along the ground. Qays bin Sa’ad said: I accompanied the Prophet sallAllaahu alayhi wa sallam ten years. Aasim Bin Umar mentioned that the Prophet appointed Qays bin Sa’ad over the charity. Then we found that his son was like him. Qays’ generosity is used for parables and likewise is his smartness and shrewdness. ‘Cesar the ruler of Rome sent the tallest man they had to Muwaweeyyah RadhiAllaahu anhu and challenged that there is no one as tall as him amongst the Muslims. Muwaweeyyah said to him stand next to this Roman. Qays said: ‘No, I swear by Allaah I will not give him that honour. However, here are my Sirwaal (trousers) measure him against it. ‘I intended by this so that the people know that this is Qays’ sirwaal in front of a number of witnesses. So the people will not say that Qays disappeared and returned with a sirwaal or he brought remnants from the people of Thamud. Indeed I am a leader in a Yemeni area and the people are either leaders or followers. and I have been created the tallest amongst men.